GARDENA, Calif. – May 10, 2018 – The inaugural Team Shelby Movie Night and 6th Annual Carroll Shelby Tribute Car Show will create the “Shelby Los Angeles Weekend” celebration on May 18 and 19, 2018, in Gardena, California. This family-friendly weekend hosted by Carroll Shelby International, the Carroll Shelby Foundation, Shelby American, Team Shelby and Carroll Shelby’s Store will feature dazzling new vehicle introductions, a car show, displays, games, iconic film, live music and more. The weekend will begin on May 18 with a free Team Shelby Movie Night, featuring the iconic film BULLITT at 6:30 PM. Every generation Ford Bullitt Mustang will be on display including a 2019 model. The night will feature live music by the band “In Contempt”, food trucks, trivia, live auctions and more. The next day, the Tribute car show will host a series of presentations including two car introductions by Shelby American. The Carroll Shelby Foundation will also make a donation to The Eli Home, a nonprofit organization focused on breaking the cycle of child abuse and family violence. The show will include a presentation by the Original Venice Crew, live music by the Chuck Alvarez Band, games, adult tricycle races and autograph session. Attendees will see rare Shelby and Ford cars from the past 50 years. Carroll Shelby’s Store will showcase its latest merchandise. Enthusiasts can even join the “Rev Your Engine” salute to Carroll Shelby at 2 PM. Admission is free for spectators and proceeds from the car show participants will benefit the Carroll Shelby Foundation. To learn more about the 2018 Carroll Shelby Tribute and Car Show or the Carroll Shelby Foundation, please visit http://carrollshelbytribute.com/. The Carroll Shelby Foundation (www.shelby.com) was created by legendary racer and automotive manufacturer Carroll Shelby. 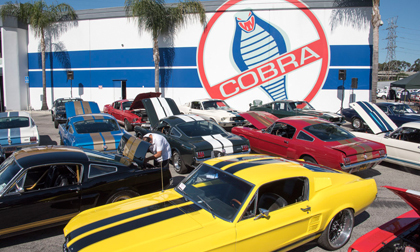 Headquartered in Gardena, Calif., the Foundation is dedicated to providing medical assistance for those in need, including children, educational opportunities for young people through automotive and other training programs and benefitting the Shelby Automotive Museum.